Stop by our Holiday Shop to view our wide selection of wreaths, roping, centerpieces, swags, hand-painted ornaments and more! Sip complimentary hot cocoa or spiced cider and enjoy a fresh-baked cookie as you warm your hands by our antique wood-burning stove. 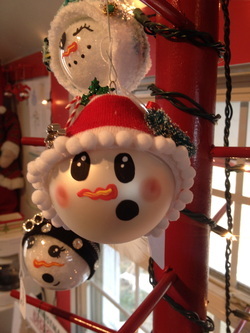 Below is a sample of our ornament selection. Some of our wreaths and centerpieces below.